Paul Harris was the founder of Rotary in 1905 and the Rotary Club of Falmouth was established in 1922 and is one of the oldest, continually operating Rotary Clubs in the United States. 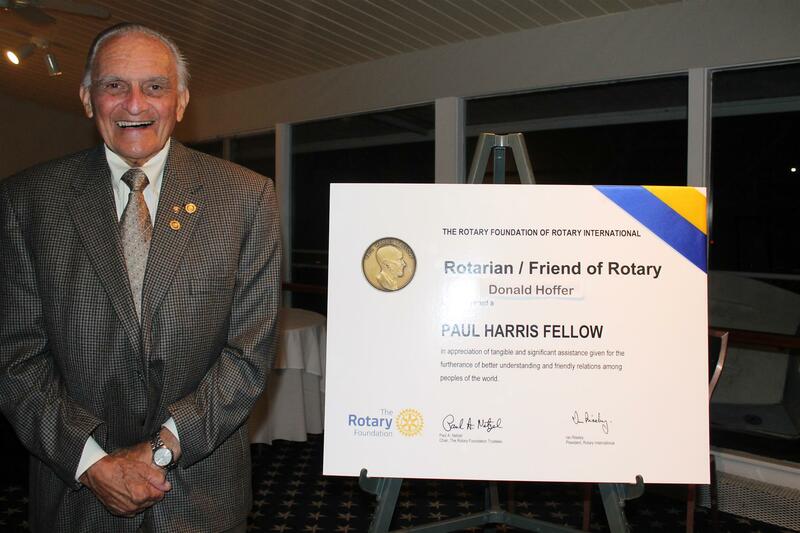 The Paul Harris Fellow Awards was instituted in 1957 and is established with a donation of $1,000 in the name of each fellow to the Rotary Foundation which utilizes the funds to support its many international and locally based projects and good works. Fifteen past recipients of the prestigious award were present at the dinner, as was Lynn Rhodes, whose father Scoba Rhodes who recently passed away and was posthumously recognized as a Paul Harris fellow for his well know community involvement. Club President Bob Mascali presented the award to Chief Dunne in recognition of his service to the Falmouth Community noting that the Police Department’s mission to “Protect and Serve” is quite similar to Rotary’s mission of “Service Above Self” which is exemplified by Chief Dunne. Rudy Hunter, a recipient of a prior Paul Harris award himself presented the award to Don Hoffer noting his many community achievements, most recently as Falmouth Superintendent of Beaches.